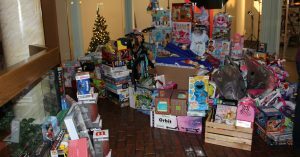 Spaulding Youth Center is thrilled to announce it was chosen as a gift recipient by the 7th Annual Tower of Toys hosted in Manchester, NH. For the second consecutive year, the organization received a generous donation of toys and gifts for its students and children. Coordinated and promoted by Manchester-based businesses, the Tower of Toys is a charity organization that collects toys for families and children in need during the holiday season. The goal each year is to build a “tower of toys” in the atrium of the Beacon Building on 814 Elm Street in Manchester, New Hampshire. Over the past seven years, the number of participating businesses has increased as has the tower’s impact. Spaulding Youth Center serves many students and families from the greater Manchester area and is honored to accept the donations on behalf of these local children and their families. 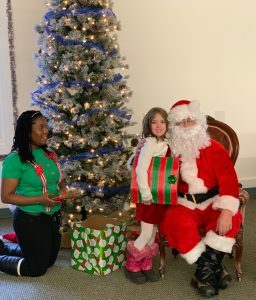 The gifts were distributed to those children who live on its campus in Northfield, New Hampshire as well as to day student families who were in need during the holiday season. To learn more about Tower of Toys, visit https://www.facebook.com/toweroftoysnh/.